G7: Six nations worried about Trump’s USA: a setup for WWIII? Divisions between Mr Trump and the other six leaders go way beyond trade – they include climate change, relations with Iran and the Israel-Palestinian conflict. Donald Tusk, who, as president of the European Council, is representing the EU at the summit, said the Trump administration and the rest of the group have clear differences on trade, climate change and the Iran nuclear deal. Many are seeing the USA as a threat to the international order–this will set up the world to support actions against the USA that I would term World War III. While I have issues with the the writer of the above piece, the reason I included it is to point out that the path to World War III will include trade disputes between the USA and Europe and that some others are now hinting that as well. While most writers are not looking at biblical prophecies, more and more are seeing issues between the USA and Europe. So, notice that the Europeans are being told the time to rely on the USA is up and Donald Trump has made that clear! Europe will take steps. The top European leaders have had it with the USA and are even publicly telling everyone that. Things will not remain as they have been. It is likely that the Europeans consider Donald Trump’s ‘piggy bank’ statement as insulting. What is going on between the USA and Europe shows that things ARE changing. Forbes posted an article by John Mauldin titled “2020s Might Be The Worst Decade In U.S. History.” The article claimed that US debt is destined to rise dramatically as well as cause financial problems with Europe. He claimed that unemployment would greatly increase as well. He claimed a reset, like a biblical jubilee debt release, would be the logical solution. He claimed that the 2030s were then likely to be good. Could the 2020s be the worst decade in USA history? How might Habakkuk 2 play into any of this? What about Jeremiah 30? Could Jesus possibly return towards the end of the decade? Could the USA experience sorrows, troubles, and possibly the Great Tribulation in the 2020s? Could the 6000 years be over then? Could the 2030s be a fantastic time ushering in the millennium? Dr. Thiel addresses these issues and more. The USA is pushing Europe to rise up against it. Expect to see more issues next decade. The problems will not end with Donald Trump. The distancing of Europe from the USA is encouraging them to build their military. Since Donald Tusk is thanking Donald Trump for busting illusions that the USA and Europe should be friends, Europeans are being publicly told that they cannot rely on the USA anymore. And this means in matters of defense. Donald Trump’s actions will be a factor in the rise of the EuropeanKing of the North Beast power. 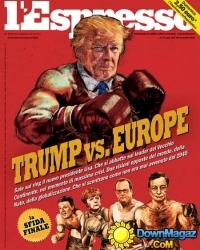 Donald Trump is one of the reasons that Europe will turn against the USA. More and more are starting to see this. The situation in the world is changing. The end of the Anglo-American order is getting closer (watch also End of the Anglo-American Orderand/or The New World Order Is Leaving the US Behind) and the final time of the Gentiles is almost here. Trade Wars: Are COG warnings coming to pass? Could the Large Hadron Collider lead to destruction?